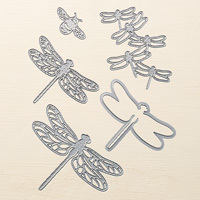 Dragonfly Dreams Photopolymer Stamp Set | Stampin Up! "Stamp like a dragonfly, sting like a bee." It's almost the same as Muhammad Ali's motto, but much craftier. This is a Two-Step Stampin’ set. Combine individual stamps to create the final image you want in the colors you want.